Everything I do lately seems to be a little bit random, and last night’s dinner definitely was. But I can explain: I had chosen the two recipes I wanted to blog, and then had a huge craving for an Amy’s frozen pizza. And one of my favorite things about living alone is that you can eat whatever you want, whenever you want, and you don’t have to explain a thing to anyone. 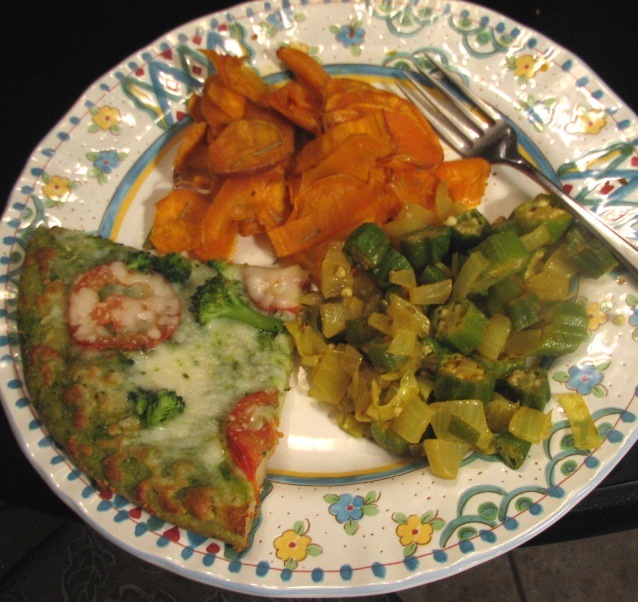 So my dinner last night was an Amy’s frozen pesto pizza, okra and onions, and sweet potato chips. 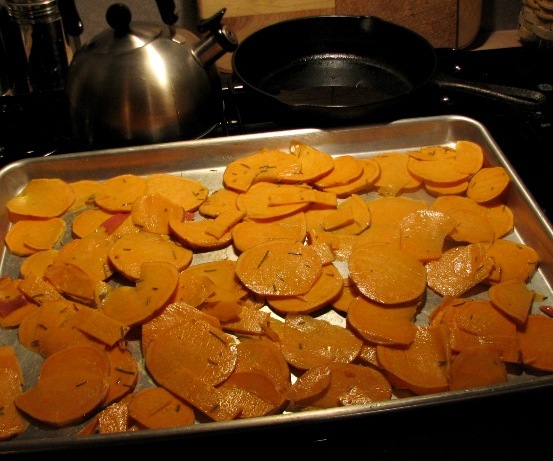 I found the recipe I used for the sweet potato chips in the October 2010 issue of Vegetarian Times. This recipe is not posted on their website yet or I would link it here. Their recipe is for making the chips in a dehydrator, but I altered the ingredients a bit, then popped the chips into the oven. I was really surprised at how many chips one large sweet potato makes! Thinly slice the sweet potato, getting the slices as thin as you can. 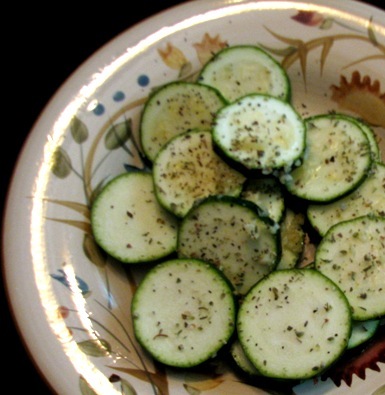 Place the slices into a bowl and toss with the olive oil. I started with one tablespoon, then just added as needed. 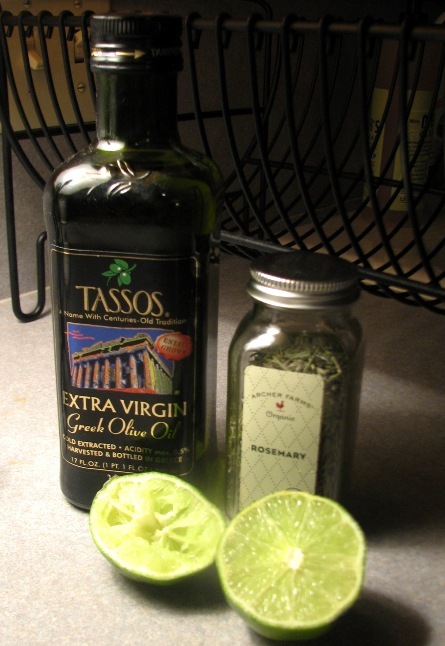 Once your slices are coated in the oil, add the lime juice and crushed rosemary, tossing to cover. Then sprinkle sea salt on the surface and toss again to coat. Heat the oil in a skillet over medium heat. Add the cumin; cook 10 seconds. 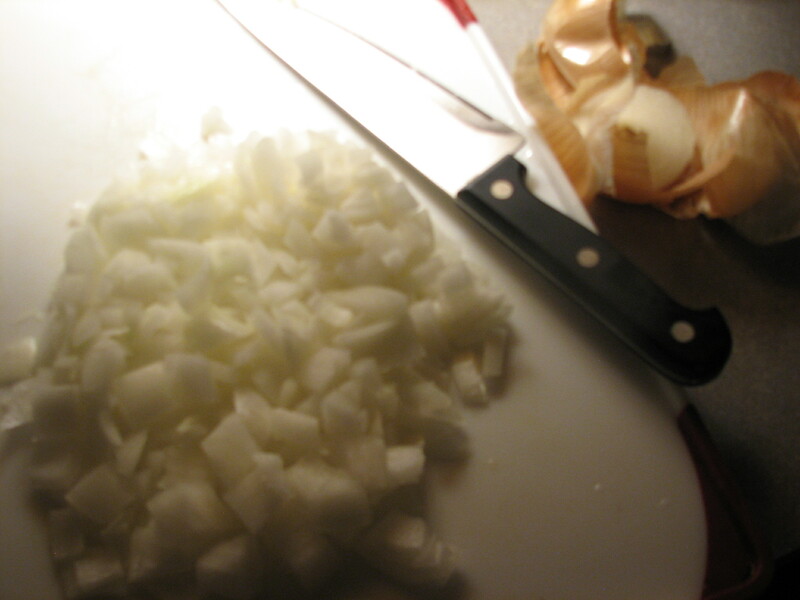 Add the onion; saute 3 minutes. 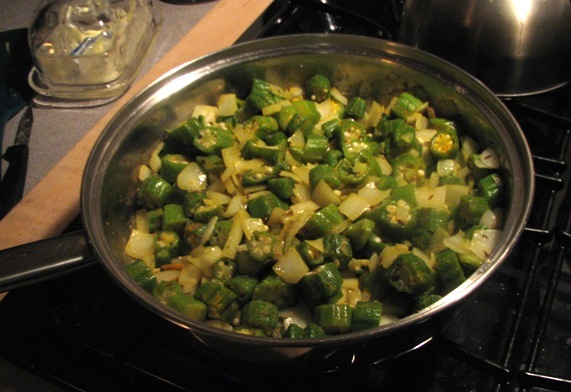 Stir in okra, then coriander, salt, and turmeric. Also add the cayenne pepper at this point. I just sprinkled a little bit of cayenne into the pan, I am a bit afraid of heat – I’ve ruined a few dishes making them too hot for my taste. Cover and cook 10 minutes, stirring once or twice. 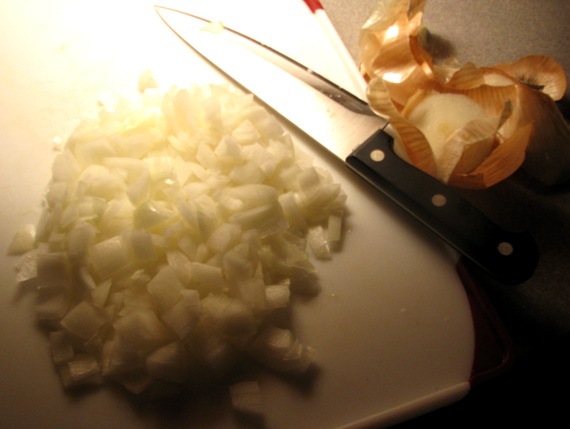 I cooked mine a tiny bit longer, uncovered, until the onions were clear and just beginning to carmelize a little. 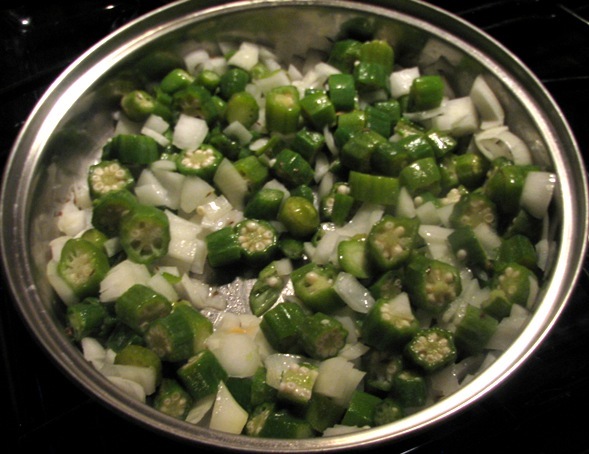 Once the okra and onions are cooked, stir in the amchoor or lemon juice (in my case lime juice) and sugar. 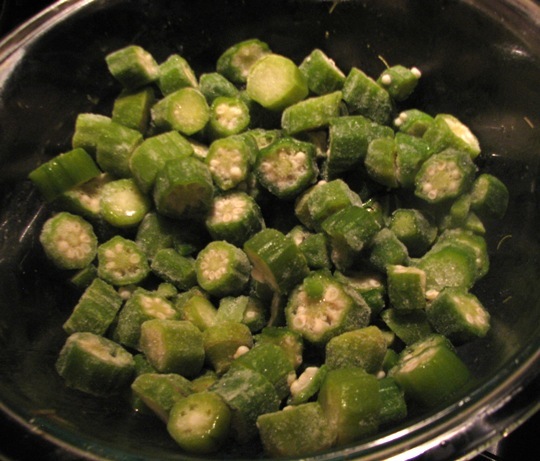 I really liked this recipe, the okra and onions have their own flavors, and then as you eat it you taste the various spices at different times, and then the sweetness of both the onions and the tiny bit of added sugar also comes through. It’s simple, quick and delightful. I played around on a web project too long today and found myself starving and shaky with no plans for dinner. I was thinking about pasta, but when I saw a couple of different kinds already open in the kitchen, I didn’t want to open a new box. So I threw some water on to boil, with plans to blend some shells and thin spaghetti, and top it with a concoction of leftovers. I had on hand a half zucchini, a can of black beans, and a half jar of pasta sauce. 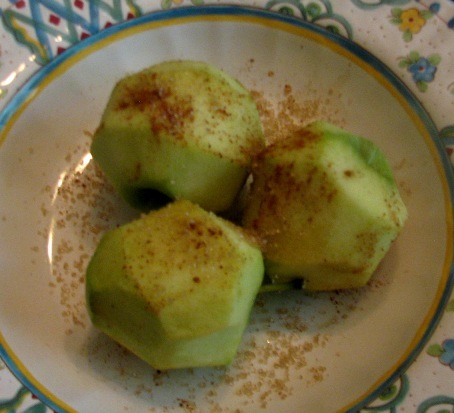 I also had some apples from my friend Lise’s tree, which would make a perfect dessert. While the water was boiling I peeled the apples, but left them on the core. Then I put them into a bowl and drizzled vanilla extract over them, sprinkled nutmeg and cinnamon on them, then shook a couple of spoonsful of raw sugar over the bowl. I popped those into the microwave for three minutes. While the apples cooked, I sliced the half zucchini onto a plate, along with a couple cloves of prechopped garlic from a jar, dried oregano and basil, and some cracked pepper and sea salt. I set that aside until the microwave was available again. 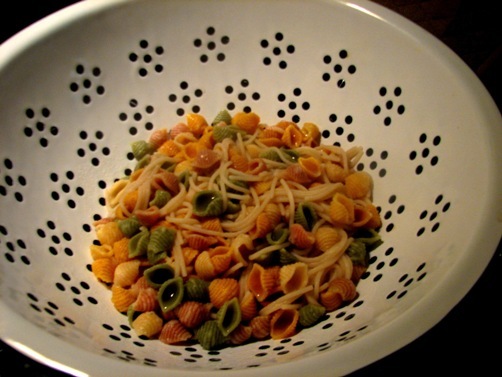 Once the water was boiling, I put both pastas into the water. 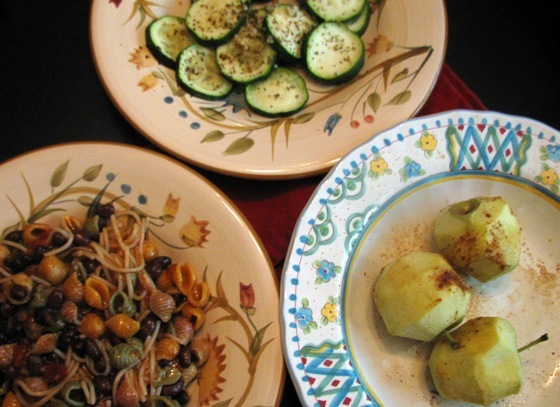 When the apples were done, I put the zucchini dish into the microwave for three minutes, too. I opened a can of black beans and rinsed and drained it. Once the pasta was done, it was drained and added back to the pan, along with some olive oil, which I then tossed it in. I added one can of black beans, and 1/2 jar of pasta sauce to the noodles and tossed. By then the zucchini was finished microwaving and I sat down to have my delicious hot meal that didn’t take more than 15 minutes to make! Every thing I used in the meal was organic. 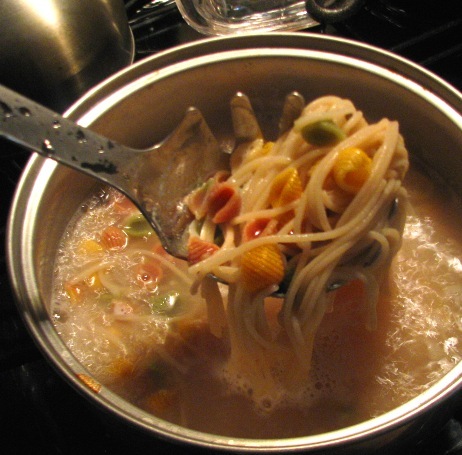 The noodles and beans were from Eden Organic, the spices, herbs and pasta sauce were Archer Farms. You gotta love that. 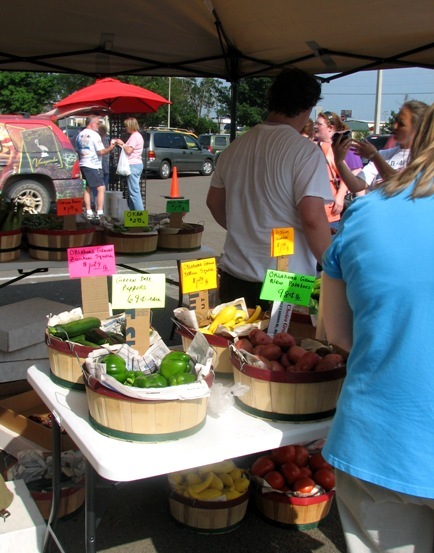 THIS PAST WEEKEND HAS BEEN busy and has spilled over into this new week, starting with a trip to the nearby Moore’s Farmers Market on Thursday. My friend Marcie lives up there and she took me around to introduce me to some of her new farmer friends. I had a great time! I also came away with some good zucchini, other types of squash, and onions. 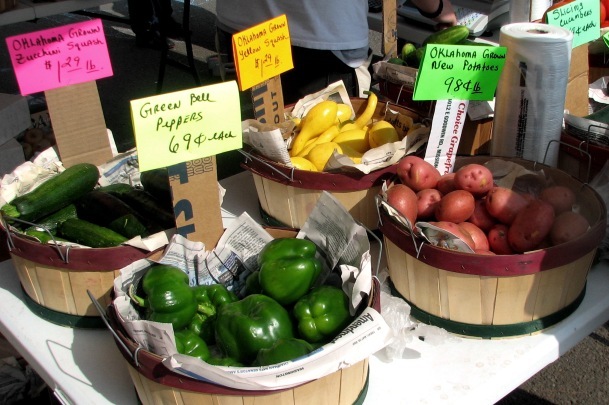 I love the freshness of the food just brought in from someone’s farm! 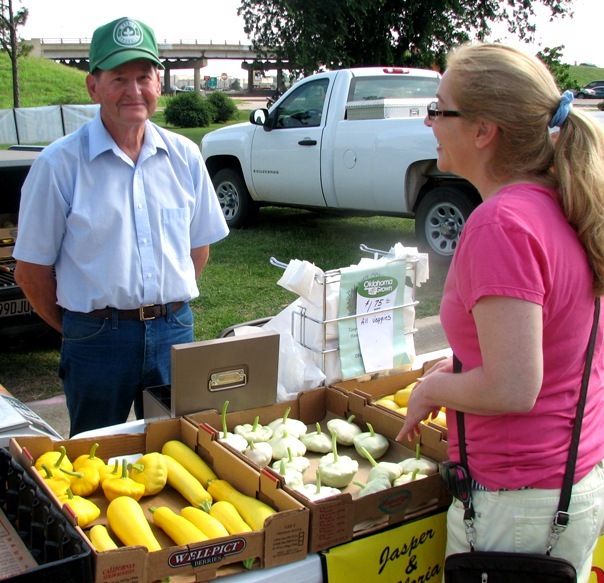 Two of the farmers gave me info on their farms, which are open to the public — I can’t wait to go visit. An Oklahoma winery was also set up there, and I grabbed their info on the way out, for yet another field trip. 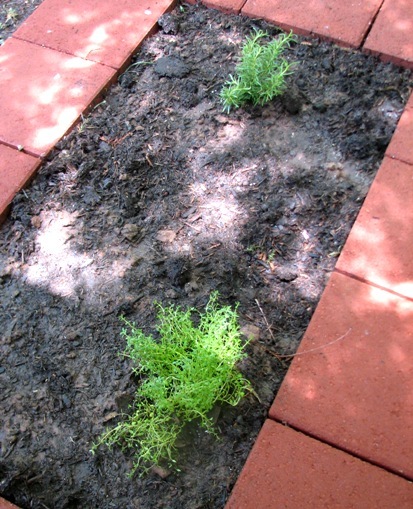 After some quick planning, I managed to get my act together for planting some vegetables and herbs. I had my beds all prepared, but no plants. I made a quick run to the local Lowe’s and grabbed a thyme plant, rosemary plant, and organic seeds for two types of tomatoes, two types of lettuce, bell peppers, and basil (omg I love basil). 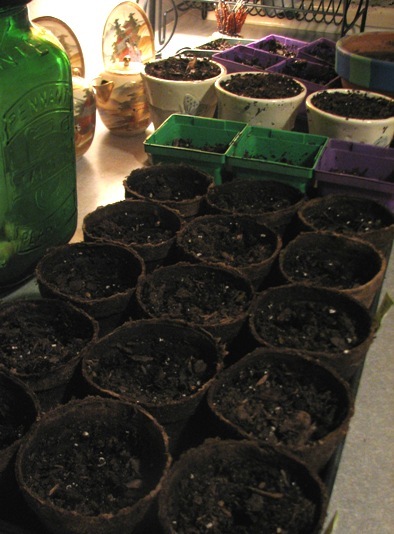 Yesterday I got the plants into the beds, and all of the seed into trays. (Side note: Lowe’s also has a couple of different organic soils.) 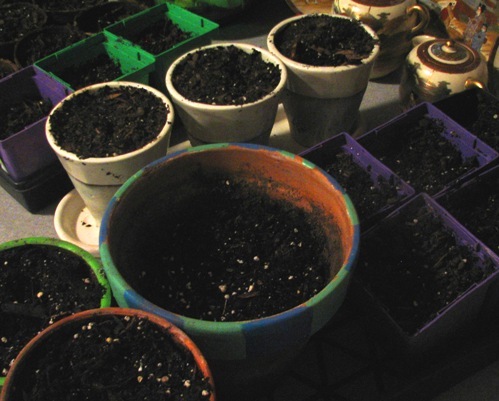 The lettuce seed is unplanted as of yet, since it is sown directly outdoors and just sprinkled with soil. We had a gully washer today, and I didn’t want my little babies washed away. I’ll likely spread the lettuce seed tomorrow. Once I get the plants hardy enough to move outdoors, I want to fill in spaces with plants that attract bees and butterflies. I’ve posted a lot of good gardening links for homemade bug sprays and other things on my facebook page. I hope you can have a look and “Like” the page. I took Sunday to begin planning a good schedule for this blog, and I am working on some ideas for a couple of new blogs (can’t wait!) Tomorrow will be one more day of planning, and then food shopping, before I get back into the full swing of things. Cook the rice ahead and put aside (check package, can take 45 minutes to an hour). 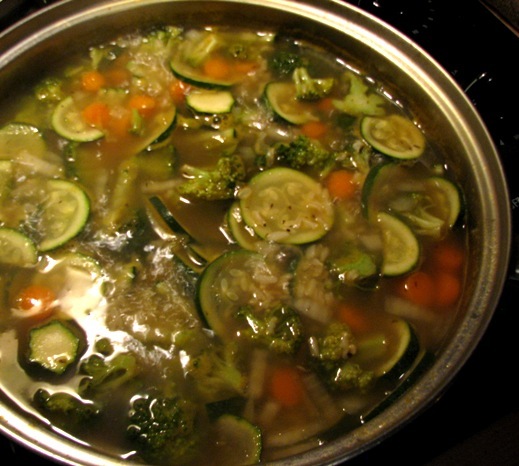 Into a saucepan or skillet, pour broth and add all vegetables. Add pepper and thyme, and bring to boil until carrots are softened. 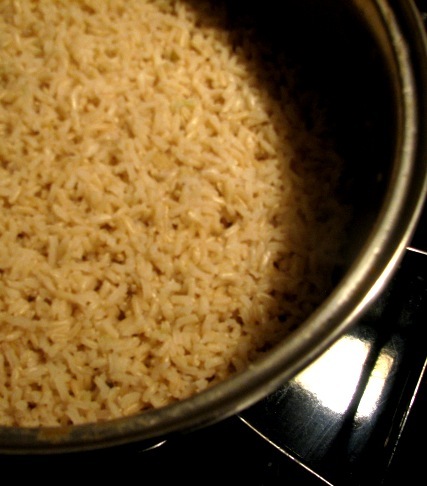 Stir in the cooked rice and serve hot. 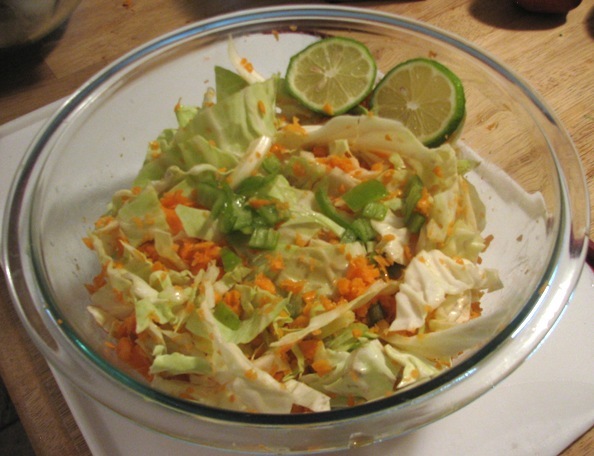 TODAY I’VE THROWN TOGETHER this new recipe from Real Age for Sweet Potato and Cabbage Slaw. I followed the recipe fairly closely, but I did use green onions instead of shallots, since I had some on hand and I did use half an anaheim pepper left over from another recipe instead of the serrano or jalapeno pepper. And I have to say, it’s still a very delicious slaw! 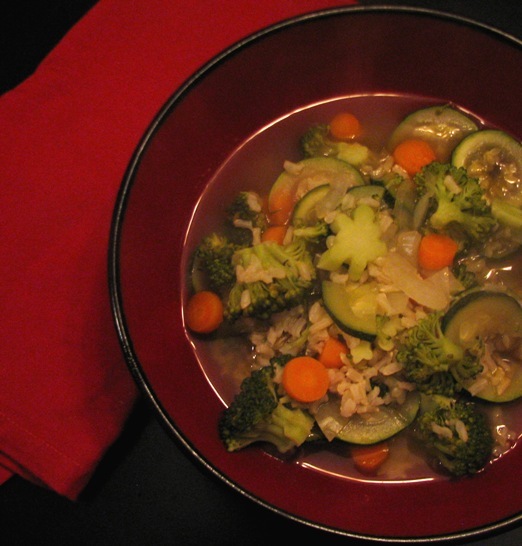 I love the smoky nutty flavor of the sesame oil. The flavor of the sweet potato is so similar to a shredded carrot that I really can’t tell the difference and when I made it last time I even had to tell people that it was sweet potato. 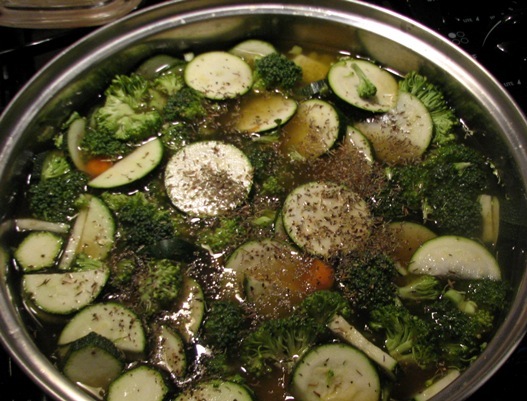 I’m taking a bowl of this to my friend Tracy’s house tonight to have with some tilapia she is making. She doesn’t realize it, but she’s just begging to write a guest post for this blog! I don’t eat tofu, so I substituted goat cheese in this recipe. 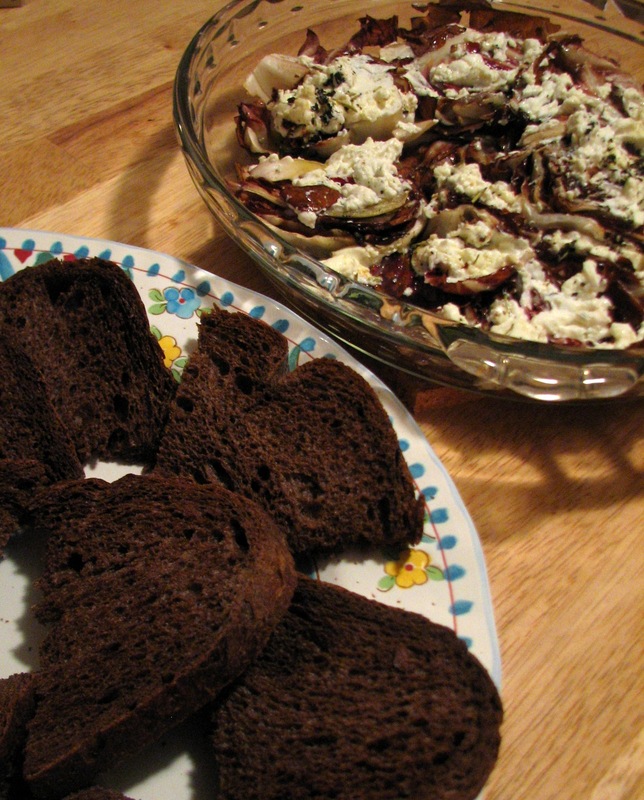 In two small mixing bowls, I divided 4 ounces of goat cheese. 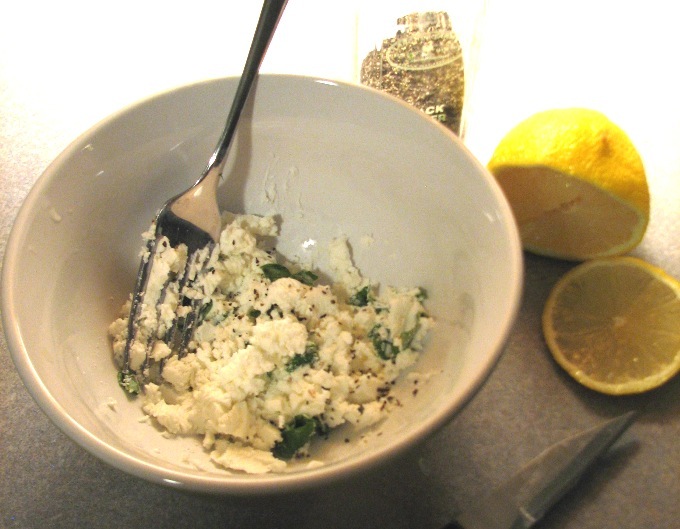 I added chopped fresh dill and a couple of squeezes of lemon to the goat cheese in one bowl, along with a dash of cracked pepper, then blended with a fork. In the second bowl, I added chopped fresh basil and cracked pepper. I’m not sure it’s possible to use too much dill or too much basil — in my house it isn’t. 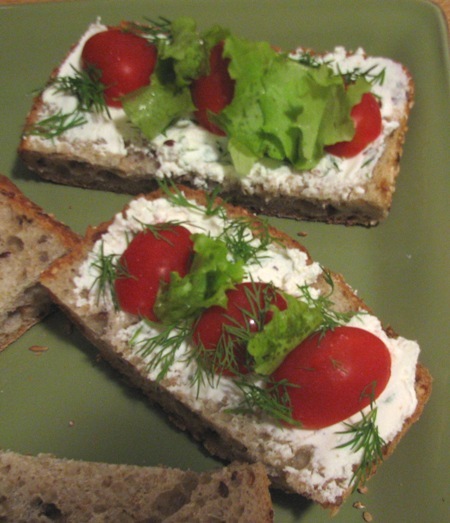 I have always loved basil and cream cheese and with goat cheese I can closely imitate that flavor combo, with just a little bit of added tang. After blending the herbs with the cheese, I spread half of each mixture on 1/2 slice of wheat artisan bread. 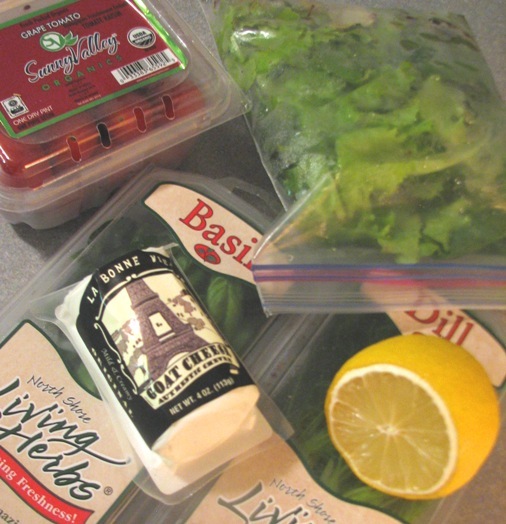 I topped the dill mixture with halved grape tomatoes, more dill, and pieces of fresh lettuce. 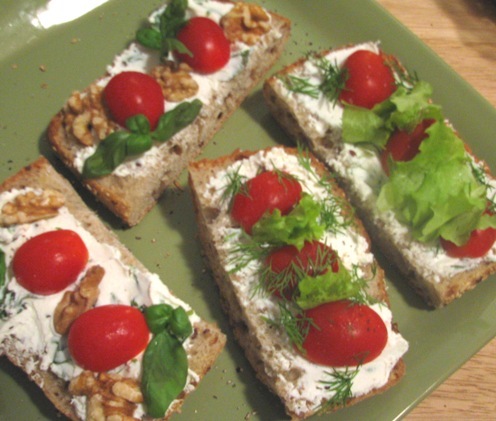 The basil mixture was topped with tomatoes, more basil and walnuts. Then I sprinkled the entire dish with cracked pepper and sea salt. This recipe is good for a brunch or lunch, snack, or even as an appetizer if entertaining. The flavors are very savory, and the bread gives it some weight — delicious and filling. ONE THING I LOVE ABOUT cooking is occasionally you think you are out of food, then you discover if you just throw a few things together you can make something delicious. That’s what happened to me today. 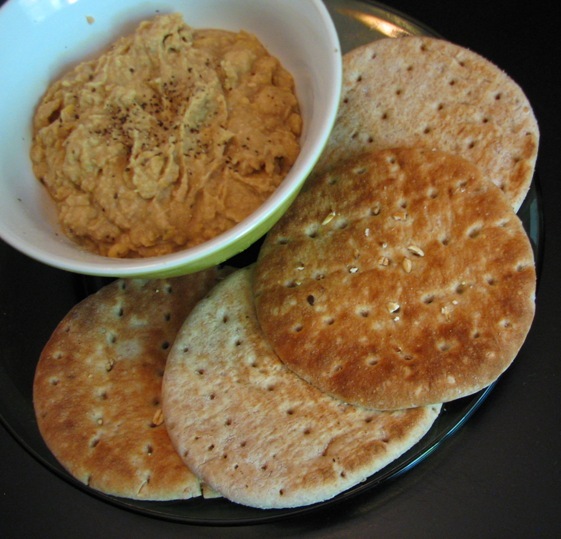 I had a can of chickpeas, so I did an online search for recipes and found Fusion Hummus at allrecipes.com. Since I only had one can of chickpeas on hand, I exactly halved the recipe. 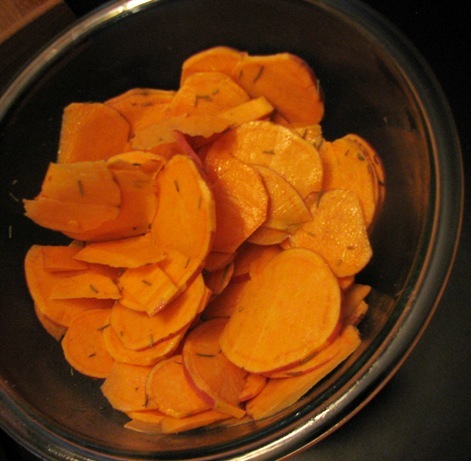 I also used dried rosemary, 1/4 teaspoon crushed, instead of the fresh. After putting all the ingredients into my blender, I shook a few dashes of salt and pepper on top, and blended. A few pieces of whole grain flatbread made for a very delicious lunch. I think the tanginess of this hummus makes it a perfect side dish for a cookout or picnic. It will be perfect alongside potato salads, pasta salads or other Memorial Day type foods. Serve with chips, crackers, or breads. Tonight I made this tasty, interesting appetizer, and I almost made it like the original recipe. The only things I did different, which are minor, are that I left the garlic in the oil when I added the herbs and pepper and I served it with dark rye toast points, not french bread. 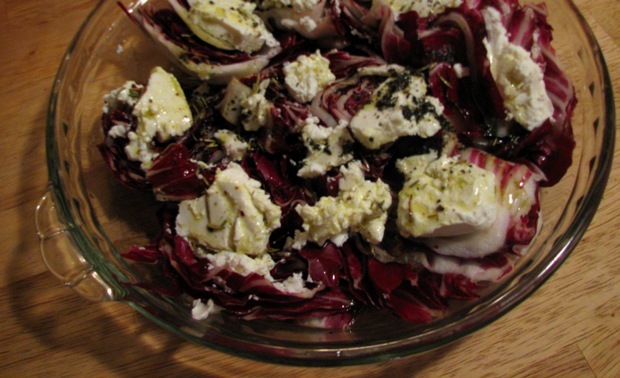 Here is the original recipe from Epicurious for Baked Radicchio and Herbed Goat Cheese. The flavors are so different, with the marjoram, basil and rosemary in one dish, along with garlic, goat cheese and radicchio. The blend of aromas when it’s baking makes the house smell sooooo good! This is a good recipe for an appetizer, but could also be served as a side dish to a meal.